You can swim in shady places along the course of the Beaume ; the water is appreciated for its coolness and purity. 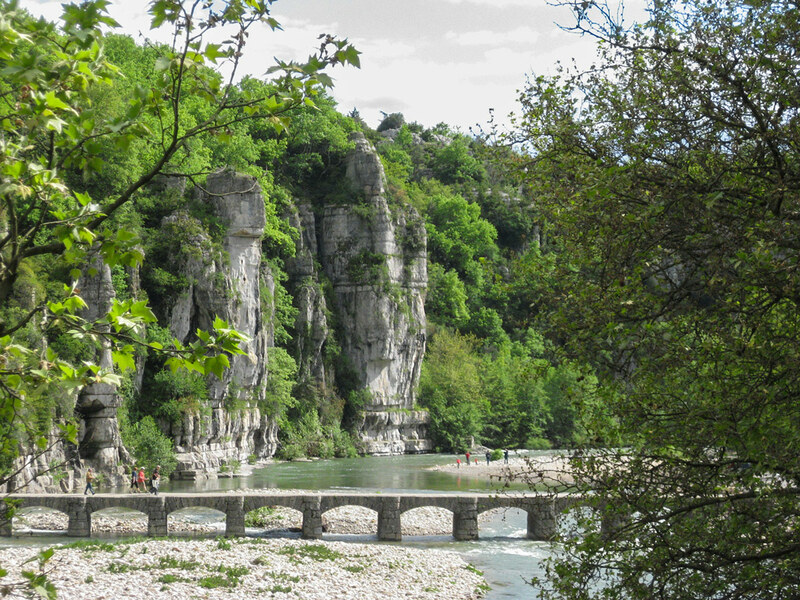 There are 5 km from our campsite to the entry of La Beaume river gorges. You can park your car before the Pied de Boeuf bridge and descent by foot to the torrent. And you see the paradise: crystal-clear water with 24-27degres. The depth is 3 meters, so you are able to dive. For children or persons who are not able to swim, you have to descent more down by foot or by car. At La Marette camp-site you are in the kingdom of hill walkers, ramblers and mountain bikers! No need to look any further for an attractive place to indulge your favourite activity. You can start out from the campsite, with walking boots on your feet, for the assault on Tanargue. This starts with the healthy walk to La Cham du Cros which you have scoffed at since you arrived. Cyclists have no less of a choice, provided they are reasonably fit. But unless you set out with your horse and knapsack, you will have to make a little effort to get to the nearest horse riding centre. The map of “400 walks and horse rides in the Southern Ardèche” can prove very useful for organising all your activities. For a descent of the Ardèche by canoe: Information and reservation at the campsite reception. You enter the “sporty” section of the route at Vallon Pont d’Arc. The water is very turbulent in the rapids. In the spring, the water level is raised to that of a torrent and assures an agreeable descent. Aubenas, Voguë, Balazuc et Ruoms. These towns are also boarding points for a number of equipment hirers. There are many excursion possibilities. In general, the routes extend only as far as Ruoms, but you can choose to make the complete descent of the Ardèche which will bring you to Saint Martin d’Ardèche at 50 kilometres from your departure point. The “col de Meyrand” is the ideal take-off place. The rising air currents from the Beaume valley keep you in the air far longer than you would have ever imagined. Canyoning, Via Ferrata, Climbing, Tree climbing are also thrilling activities that you can practice during your stay in Ardèche. You can book your off-site activities with our agreed suppliers at our reception desk. In Joyeuse (20 km), the museum displays the rich Ardèche culture. In the restored building of the convent of the Oratoriens, you can discover memories of days gone by. This is a favourite destination for walkers, horse riders and mountain bikers. You can start on foot from the camp-site. The “Tour du Tanargue” is a horse ride which is highly rated by the experts. Elsewhere there is a detailed map of “400 walks and horse rides in the Southern Ardèche” where the Tanargue is widely represented. 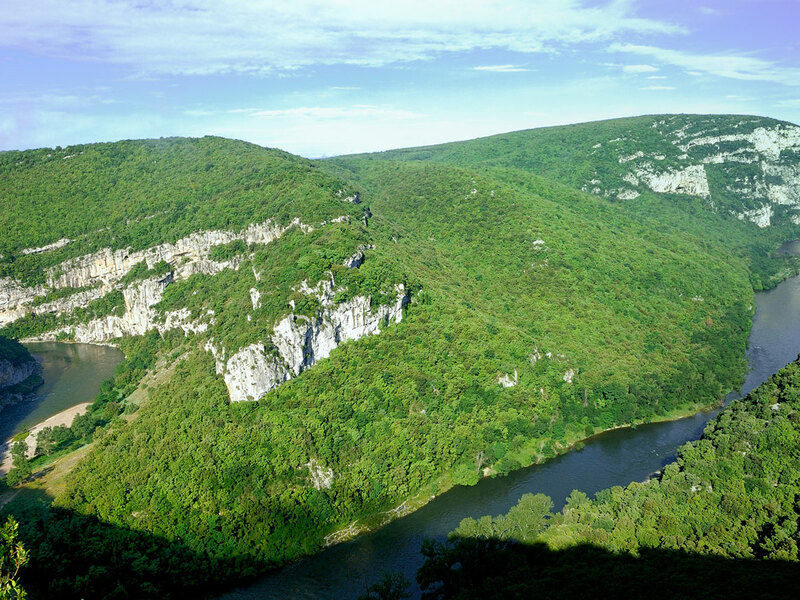 The entrance to the gorge is 6 km west of La Marette at a place called Pied de Boeuf. The road, carved in the mountainside, borders the river Beaume up to Joyeuse at some 20 km away and offers an impressive view. The quality of the water in the Beaume is much prized and bathers don’t hesitate to come from afar to refresh themselves here. The mountains of the Vivarais cévenol extend from the Tanargue range in the north to the Cévennes in the south. 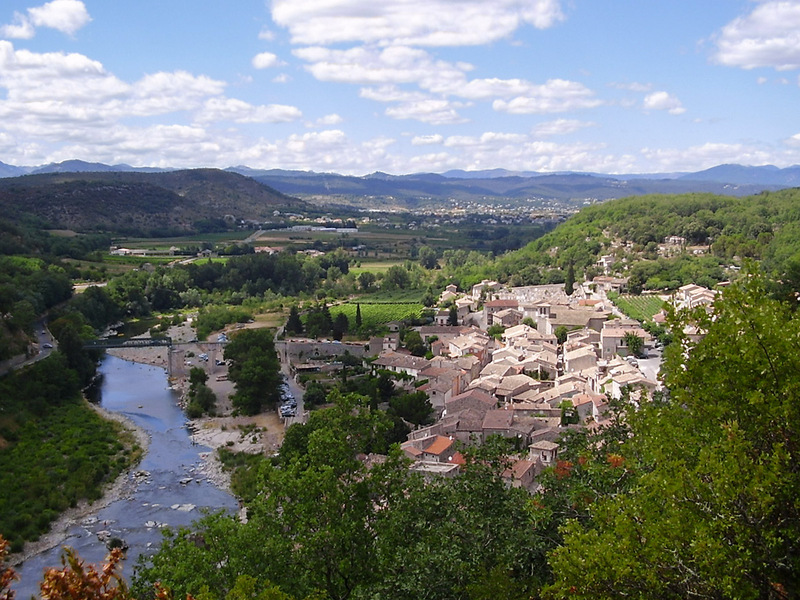 If a visitor to this region takes the route along the corniche they will have a splendid view of the countryside of the Beaume and Drobie valleys and the hills of the Basse Ardèche. Situated at an altitude of 1.371 metres (3,770 ft), the col of Meyrand is the gateway to the Southern Ardèche for travellers coming from the North west via the plateau of the Haute-Loire. The views from the “corniche” (high mountain road) below the col and the immense panorama of the Cévennes and Mont Ventoux are remarkable. The col is 25 kilometres from La Marette camp-site. The start of the gorge is really after Vallon Pont d’Arc which is 35 kms from la Marette. 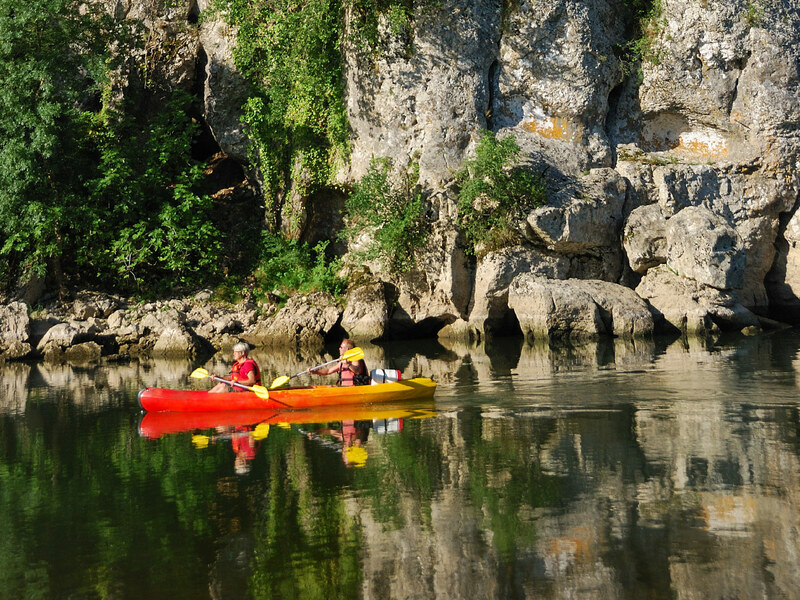 A canoe trip is an original and active way to find out about the Ardèche gorge. (See the page on Leisure activities.). The walk along the panoramic path offers a wonderful view from a succession of viewpoints known as “belvederes”. Less than 15 kilometres from La Marette you can explore the ravines of the Ardèche. Between Aubenas and Ruoms the Ardèche makes a series of meanders through ravines. The most famous beauty spots are those of Balazuc and Ruoms. 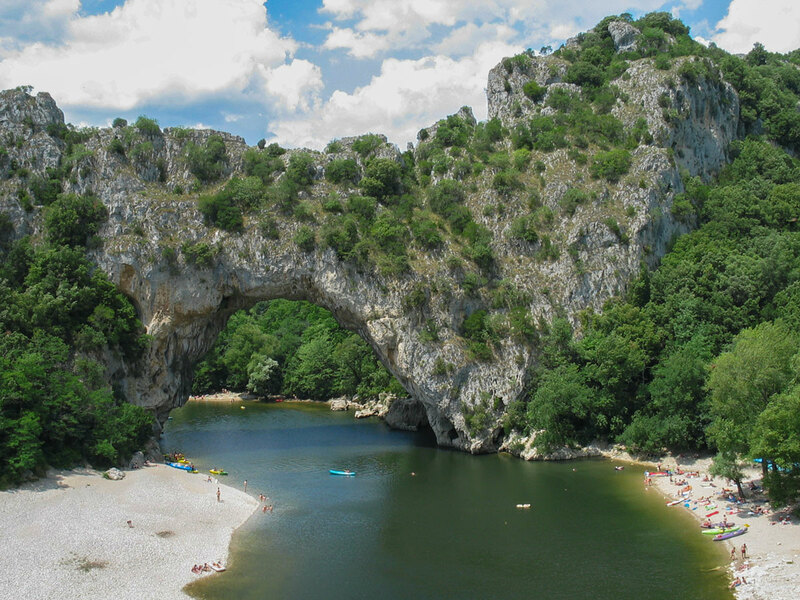 You can canoe on the river as far as Vallon Pont d’Arc or you can canoe into the Ardèche gorge.